Mahi-mahi are highly sought for sport fishing and commercial purposes. Sport fishermen seek mahi-mahi due to their beauty, size, food quality, and healthy population. Mahi-mahi can be found in Australia, the Caribbean Sea, on the west coast of North and South America, the pacific coast of Costa Rica, the Gulf of Mexico, Southeast Asia, Hawaiʻi and many other places worldwide. They are taken on lures and live baits , and are usually found around floating objects such as wood, seaweed, fish buoys at sea. Frigate bird diving can also be an indication of the presence of Dolphinfish Mahi Mahi when there is debris in the water. Watch for flying fish. These fish are a favourite meal for mahi-mahi. 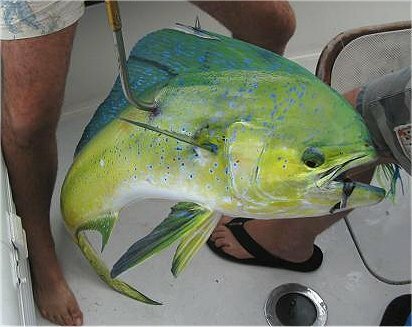 Mahi-mahi are carnivorous, feeding on flying fish, crabs, squid, mackerel, and other small fish. They have also been known to eat zooplankton, squid, and crustaceans. Thirty to 50 pound gear is more than adequate for trolling for mahi-mahi. Fly-casters may especially seek frigate birds to find big mahi-mahis and then use a bait-and-switch technique. Ballyhoo or a net full of live sardines tossed into the water can excite the mahi-mahis into a feeding frenzy. Hook-less teaser lures can have the same effect. After tossing the teasers or live chum, fishermen throw the fly to the feeding mahi-mahi. Once on a line, mahi-mahi are fast, flashy and acrobatic, with beautiful blue, yellow, green and even red dots of colour. Sport catches average 7 to 13 kg (15 to 25 pounds). Though they can grow to be up to 45 kg (90 pounds) any Mahi-mahi over 40 pounds is exceptional. Dried dolphin fish skin has been used in the past to make trolling lure skirts? It's very strong, and when it gets wet again - no matter how old - it softens up and has flash, action and smell. Current Mahi Mahi (Dolphinfish) All Tackle Record (IGFA) 87 lbs. 0 ounces.